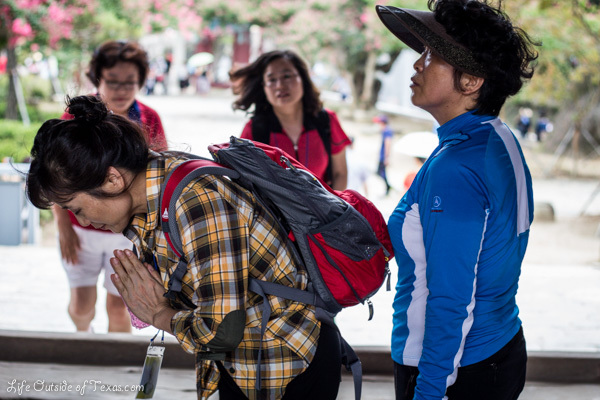 While it’s a beautiful tourist spot, it’s important to remember to be respectful because people do still come to this temple to pray. 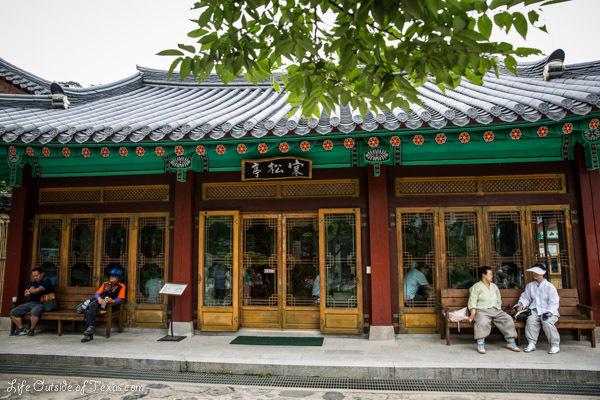 Tongdosa is one of Korea’s 3 Jewel Temples so it is highly regarded amongst the Buddhists. When visiting temples, it’s a good idea to dress conservatively and try to be quiet while you’re near anyone praying. Also, photos usually aren’t allowed inside of the prayer buildings. The entrance fee for Tongdosa Temple is 3,000 per adult, 1,500 for teenagers and 1,000 for children. Kids under 7 are free. Parking is 2,000 won. Tongdosa is the perfect place to get your Korean food fix. The restaurant inside the temple is vegetarian friendly, which is great for us because Dave doesn’t eat meat. Just slide open the doors and walk on in. There is a counter with a menu. You order and pay there first. We ordered the bibimbap and naengmyeon (iced noodles). 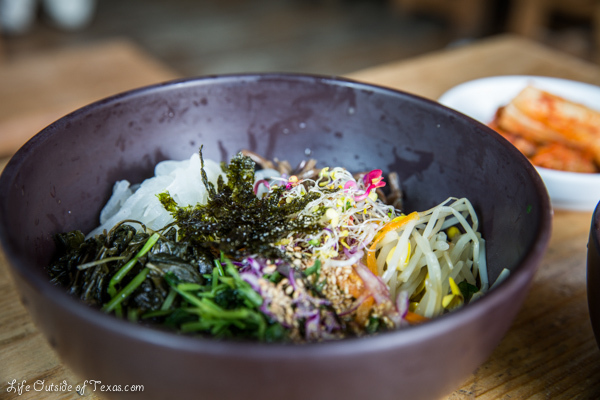 Bibimbap is just rice, topped with an assortment of veggies. There’s also a spicy, red sauce provided on the table that you can mix in. Naengmyeon is very popular in summers. Basically, It’s buckwheat noodles on ice. It sounds really strange, but it can actually be really tasty. It’s served with vinegar and spicy mustard on the side so you can flavor it yourself. They also provide scissors so you can cut the noodles. And, of course, no meal in Korea is complete without kimchi. Next step… nom nom nom! People watching is one of my favorite things to do in Korea so I always try to sit by the window. 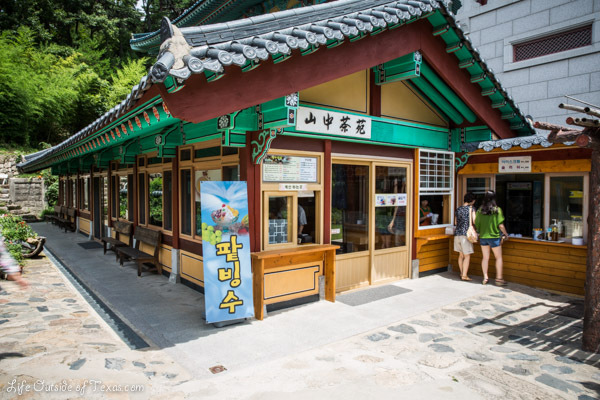 So now that you’ve eaten some traditional Korean foods and explored one of the best temples in the country, it’s time to treat yourself to some dessert. Right next to the restaurant is a dessert stand that sells patbingsu, a favorite dessert among Koreans to beat the heat in summer. 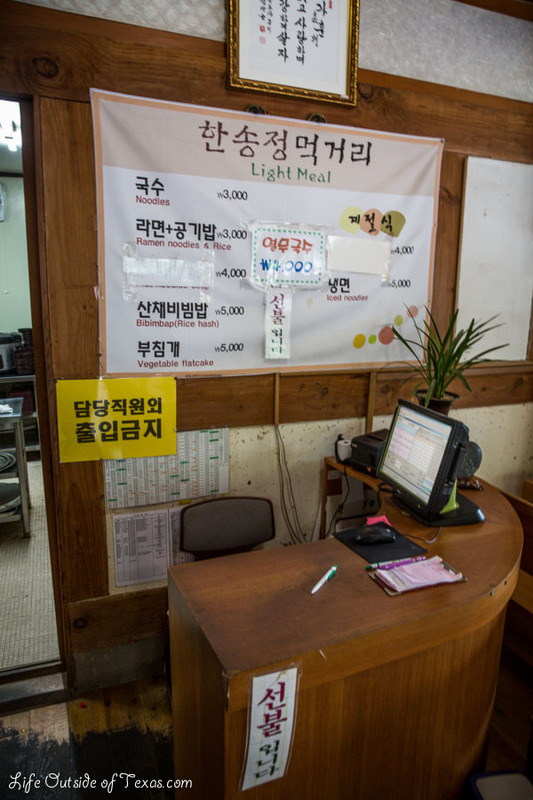 Again, go through the doors, order and then take your ticket to the woman on the right who makes the patbingsu. Then, sit down and they will bring your patbingsu to the table. This delicious dessert consists of shaved ice, condensed milk and sweetened red beans. The rest of the toppings vary by place. 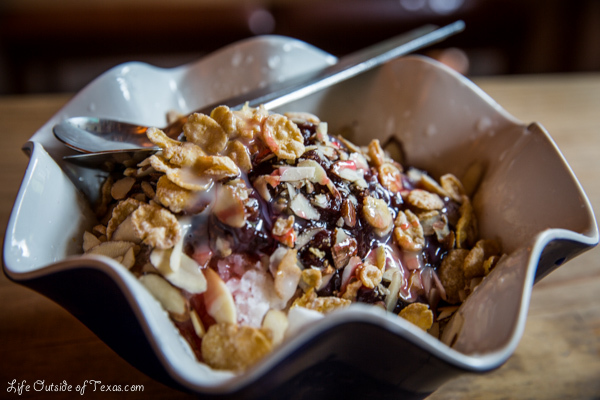 At Tongdosa, you can also enjoy strawberry syrup, almond slivers, and cornflakes on your patbingsu. Surprisingly, it tastes much better than it sounds (and looks). The cornflakes were my favorite part (and Dave was kind enough to let me eat most of them)! I hope you take my advice and go visit Tongdosa. If you can’t make it for summer, I hear it’s also spectacular in the spring during plum blossom and cherry blossom seasons. 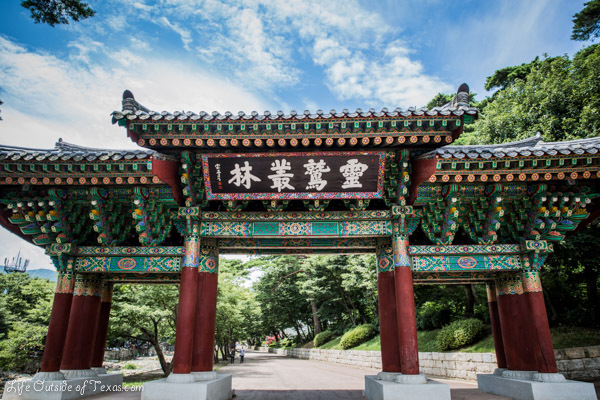 This entry was posted in Busan, Gyeongsangnam-do, Ulsan, Yangsan and tagged buddhist temple, Busan, expat blog, expat in Korea, 통도사, Korea, photography, summer in Korea, things to do in Busan, things to do in Ulsan, Tongdosa Temple, travel, Ulsan, vegetarian food in Korea, Yangsan by Meagan & Dave | HappilyEverExpat.com. Bookmark the permalink. Jill, I take that as the highest compliment coming from you! You and Aaron give me so much inspiration to be a better photographer so thank you so much for commenting. Wow! Beautiful photos. I love how you capture the people! Vegetarianism can be really hard in Korea. I’ve been meaning to get Dave out to this temple for ages, just for the food! And of course, it’s a beautiful places to visit. I don’t really care for patbingsu (I like the fruit version! ), but your picture makes it look sooooo good. haha Well, thank you! I actually don’t usually care for it, but this one was really good. Maybe it was the heat.. it’s been upper 90’s here and sooo humid! I absolutely LOVE your photos, Meagan! They really capture the beauty of the place, people, and culture. Thanks so much for sharing! Thanks, Wendy! I miss your sweet words. I hope you’re well? I was in Maui a few weeks ago and thought of you. Wish we could have met up. Thanks, LB! And thanks for always stopping by my blog and showing some love. Korea is amazing and I love living here. It’s been such an amazing experience and I love being able to share my stories and I’m always glad to hear that people find them interesting. Thanks for the comment, Kathleen! I know you’ve been to Japan, but have you ever made it to Korea? It’s a really amazing place. Not really a big tourist destination, but such a gem. And the food is so good! Ahh, I miss Korean temples! I love the designs on them, and they’re so beautiful. 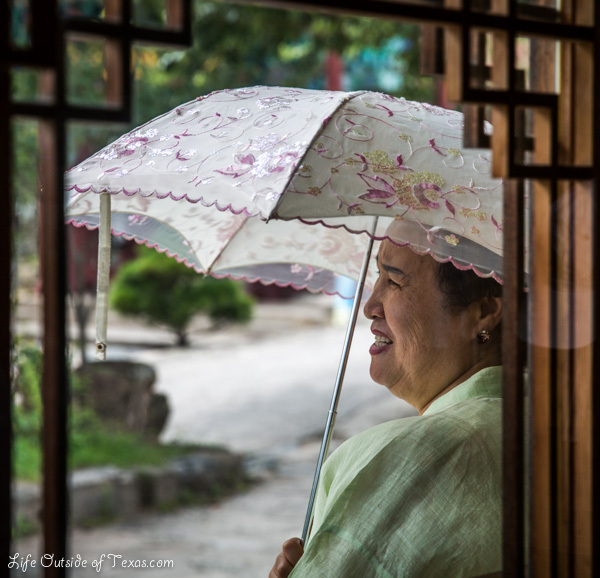 I love the photo you took through the window of the woman holding a parasol. Thanks, Tom! That’s actually one of my favorite photos of the bunch. I love Korea so much. There are lots of frustrating things about living here, but I know I’m going to miss so much about when I leave. Some of those dishes look delicious! I’ve never been to a temple that had vegetarian-friendly cuisine (other than the fried red bean paste fishies). Looks like a great place. Thanks for sharing! A lot of temples also serve a free lunch, which should be vegetarian, if you are there at the right time. Otherwise, a lot of street food vendors set up outside of temples and the vegetarian options would probably be chestnuts or hoddeok. It’s hard as a vegetarian here. And what’s worse is that Dave is a picky vegetarian so Korean food doesn’t usually work for him. Tongdosa is awesome and I’ve heard it’s gorgeous this time of year as well. Wow, that looks fantastic! I would like to go to a few more temples in Korea; I’ve been to many of the smaller ones but not many bigger ones. This one is definitely on my list! This place is pretty in spring, summer and fall. It’s a really great temple. This isn’t technical talk, but this temple has a tomb that holds some of Buddha’s bones. Naengmyeon isn’t something I’d ever order on my own, but I like to steal a few bites from other people’s. I really love that picture too. That baby was so stinking cute! I always love to see parents really involved with their children, especially here in Korea. Great photos, reminds me of the time we visited last summer. By far one of the more unique temples in Korea, as there are no Buddha statues on its grounds. The relic area was probably my favorite. Nice photos. Haven’t been to Yangsan or Ulsan. But the stream and buddhas on stones remind me of Daegu’s Gatbawi. You’ve posted all the foods that I could eat and enjoy. Yum. Beautiful temple! I’m yet to go check out any temples in Korea but I definitely plan to soon! Again, wonderful photos and they really illustrate and add to your post in a great way. Thanks for giving us a good place to go since spring and summer are on their way. One thing about the temples, however, is that I’ve always heard that thing about dressing conservatively, but I still don’t know exactly what that means. I’ve never had a problem with it, but does that mean no short shorts or something? And also, speaking of great photography, you actually make Patbingso, which I don’t like, look good in one of those photos. And you titled it, “How to have the Perfect Day.” Which I often find includes bringing exactly the right things. What would you recommend people bring? A mat to sit on?